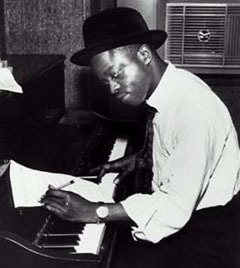 Otis Blackwell was an American songwriter, singer, and pianist whose work significantly influenced rock ‘n’ roll. His compositions include Elvis Presley’s "Don’t Be Cruel," "All Shook Up" and "Return to Sender,” Little Willie John’s "Fever,” Jerry Lee Lewis’s "Great Balls of Fire" and "Breathless" (with Winfield Scott), and Jimmy Jones’s "Handy Man." Otis Blackwell was born in Brooklyn, New York. He won a local talent contest at the Apollo Theater in Harlem, New York in 1952, at 21. He could not, however, transform his initial accomplishment into a successful career as a performer. His own recordings never cracked the Top 40 on the hit parade charts. “When you hit them with your best stuff and they just look at you, well, it’s time to go home,” he said. Blackwell then turned to song writing and soon became one of the leading figures of early rock ‘n’ roll, despite being virtually unknown to the public. Blackwell wrote million-selling songs for Elvis Presley, Jerry Lee Lewis, Dee Clark and other leading artists throughout the 1950s. He also recruited other songwriters to write for Presley such as Winfield Scott. When a contract dispute with his publishing company forced him to stop writing songs under his own name, he adopted the white-sounding pen-name, "John Davenport." Throughout his lifetime, Blackwell (aka Davenport) composed more than a thousand songs which had worldwide sales of close to 200 million records. Otis Blackwell distilled emotions into lyrics that everyone understood. One of his many hit songs, “Don’t Be Cruel,” performed by then relatively unknown Elvis Presley, went to number one on the pop charts. Even Presley was unaware of the song’s potential, recording it on the B side opposite the lead song “Hound Dog.” Although “Hound Dog” stayed number one on the pop charts for four weeks, “Don’t Be Cruel” remained in that position for eight weeks and stayed on the charts for an unprecedented 18 months. Two other early Presley hits, “All Shook Up” and “Return to Sender,” were composed by Blackwell. Otis Blackwell’s career began to slide once the Beatles hit the scene in 1964. There was a brief renaissance in 1976 when Stevie Wonder acknowledged him at a music ceremony. After he suffered a debilitating stroke in 1991, a number of artists recorded a tribute to his songs in an album entitled “Brace Yourself” which was released three years later in 1994. Throughout the 1990s Blackwell’s health declined and he died on May 6, 2002 in Nashville, Tennessee. Holly George-Warren and Anthony Decurtis, eds., The Rolling Stone Illustrated History of Rock & Roll, 3rd Edition (New York: Random House, 1976); Biography of Otis Blackwell, Songwriters Hall of Fame. Retrieved on November 20, 2006.; Brian Dalton, “Songwriter Otis Blackwell Left Music All Shook Up,” Investors Business Daily, March 16, 2007. House, 1976); Biography of Otis Blackwell, Songwriters Hall of Fame.